Our spring fundraising drive is in full swing and we need your help to raise $30,000 this month to address and end the breast cancer epidemic. Your gift, no matter the size, helps make sure we have the vital funds we need to continue challenging and changing the status quo. Can you chip in? We’re fighting the cancer industry—the interconnected web of corporations that profit from and contribute to the disease while they work hand in hand with multimillion dollar nonprofits to raise billions in the name of breast cancer. And we’ve shown again and again that when people like you and me join together to demand a better world, we can and we do win, against the odds. Donate now. Help ensure we have the funds we need to continue our independent, grassroots, patient-centered activism. We know it’s not enough to slap on a pink ribbon, make a pink purchase, or cross our fingers and hope that the companies making billions off the disease will ensure things get better. We know it takes collective action to make meaningful change. And we know it takes ongoing support from members like you. We can’t do this work without you. Whether you donate $5 or $500, you provide us with the resources we need to change the world. With your support we can continue standing up to and calling out industry giants and corporate polluters that profit from our illness and pollute our bodies. Please make a generous donation today, and help us reach our spring fundraising goal. P.S. 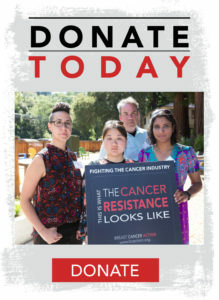 When you donate we’ll send you a “This is What the Cancer Resistance Looks Like” sticker that you can put on your water bottle, laptop, or bike to show your solidarity for the #CancerResistance. ← Help Us Change the Status Quo. Donate Today.